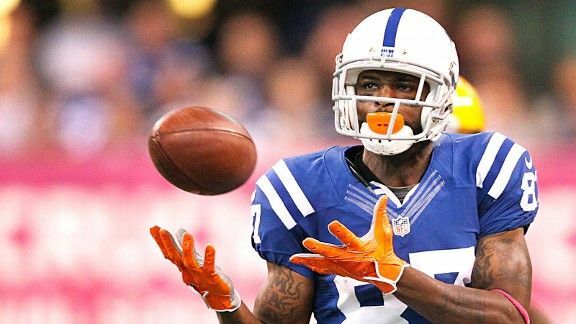 Better for Reggie Wayne: Luck or Manning? Colts receiver Reggie Wayne ranks near the top of the league in receptions and receiving yards entering Week 6, but is he better off with Andrew Luck than he was with Peyton Manning?This is the latest installment of a weekly NFL discussion that takes a closer look at one of the week’s hot topics. Today’s discussion focuses on whether Indianapolis Colts receiver Reggie Wayne is better off with Andrew Luck or his former quarterback, Peyton Manning. Early in his rookie season, Andrew Luck seems to have found a safety net with veteran receiver Reggie Wayne. Wayne had a career-high 212 receiving yards against the Packers in Week 5 and after just four games, is tied with Brandon Marshall for first in the league with 56 targets. He’s also averaging a league-best 14 targets per game with Luck under center. During the 2009 and 2010 seasons with Peyton Manning, (they were the first two without Marvin Harrison), he never led the league in targets and averaged 10.1 targets per game. Manning spread the ball around to players like Dallas Clark and Pierre Garcon but Luck has focused more on Wayne. Entering Week 6, Luck has targeted Wayne on 34.1 percent of his throws while Manning targeted him on only 26.1 percent of his throws from 2009-10. One reason Wayne is receiving more targets is that Andrew Luck has utilized him all over the field. Manning predominantly got him the ball on the left side. Wayne already has more targets in the middle of the field this season (13) than he did in both 2009 (eight) and 2010 (10). With Luck, Wayne has truly been the number-one option in the Colts offense and his versatility has been on display. That wasn’t always the case during his final few years with Peyton Manning. In their 10 years together, Reggie Wayne and Peyton Manning combined for more than 10,000 yards, 115 regular-season wins, one Lombardi Trophy and a record of success that is in no way comparable to a month’s worth of achievements with a rookie QB. From 2001 to 2010, a stretch in which Manning started every game and Wayne appeared in all but three, Wayne ranked among the league's top five in receptions (787), receiving yards (10,748) and receiving touchdowns (69) and led all players in receiving first downs (569). Those 10 seasons were the first 10 of Wayne’s career, and the list of players to catch more passes than Wayne through 10 seasons can fit comfortably on a sticky note: Marvin Harrison (927), Torry Holt (869) and Jerry Rice (820). ManningPeyton Manning was on the other end of 67 of Wayne’s receiving touchdowns from 2001-10, ranking them among the most prolific QB-receiver tandems ever. According to the Elias Sports Bureau, the only duos to connect on more touchdown passes are Manning and Marvin Harrison, Steve Young and Jerry Rice, and Dan Marino and Mark Clayton. For those counting, three of the four players on that list who are eligible for the Hall of Fame have a bust in Canton. Should Reggie Wayne one day join them, it will be because of what he accomplished with Peyton Manning under center, not Andrew Luck.